This post originally appeared on BlogHer in October 2009. When it comes to Halloween costumes, I have always pulled the working mom excuse and bought costumes for my kids. Sometimes we got hand-me-downs or found deals at costume swap events, but for the most part, we forked over large sums of money for costumes. This year was different! I was somehow inspired to make my daughter’s costume and it cost less than five dollars. If you’re already crafty and can sew, move along, you will be seriously underwhelmed! My five year old daughter was flipping through one of her favorite catalogs, Oriental Trading, where amongst all the junk she wanted to buy, she found a cute candy corn costume. I was in automatic no no no mode, but when I glanced over I thought, hey, that’s something I could make. It’s just a straight dress with three colors, two if we used a white shirt on top. Even though I haven’t sown a piece of clothing for over twenty years, I figured this was something that I could pull off, working mom or not. 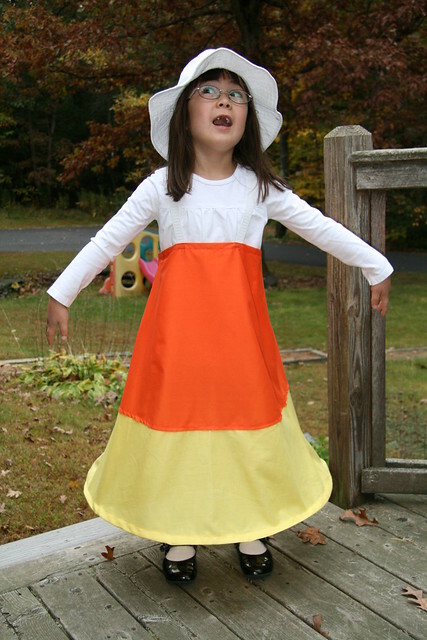 When we set off to buy fabric, I got into an argument with my daughter in the car about the order of the colors on candy corn. I said that it went top down from white to yellow to orange. She insisted that it was white, orange, yellow. 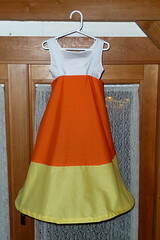 I was so frustrated that I pulled out my iPhone and did a google image search for candy corn. She was absolutely right. Already correcting mom at 5 years old! Ai! 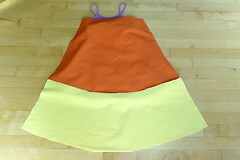 In the store, I wrapped my daughter with yellow and orange fabric and determined that we only needed one yard of each color (44 inches wide). I thought that you could buy some plastic hoop material to make the skirt hang in a circle, but the helpful fabric clerk suggested that I simply repurpose some coat hangers (can you tell that I am totally not crafty?). We went home with the $4.29 worth of fabric and a long sleeve white shirt for our chilly New England Octobers. I am by no means a seamstress, but I do know that you can’t cut a skirt into a straight triangular shapes and expect it to hang correctly. 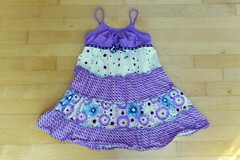 So I pulled out one of my daughter’s dresses with a decent flare to help create a pattern of sorts. 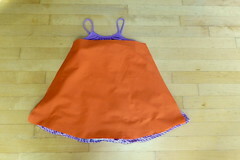 I cut two orange pieces to match the curve of the bottom of the skirt, leaving plenty of extra material on the sides for seams. Then I cut two yellow pieces below it, extending the line and following the curve. While sewing, I kept reminding myself that this costume will never be scrutinized or laundered, so it didn’t have to have perfect seams. 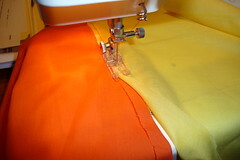 For the yellow-orange seam, I folded over and ironed the orange side of the seam and simply stitched the yellow over it on the backside. By the way, searching for orange thread turned out to be a wild goose chase, so red worked just fine. Besides, when will you ever use orange thread again? I left six inches open on top of one side and sewed in a velcro closure. For the straps, I used pieces of elastic. I won't lie, it took me about six hours to complete. But in the end, it was a success! Great job with the costume! I have a sewing machine but still need to learn how to use it. Tomorrow I will be starting (and hopefully finishing) my kid's costumes - a tiger & mad scientist. In My attics, I have two sets of crown custumes. One I bought it and the other I sewed it, both of them are cute. the one I made was comfortable for the chilly weather. I wore them for the Hollowing dancing parties at Athur Murry dancing studio. It was long time ago. It was long time ago, but the costumes still look like new and fit well with those witches black hat.